Marc Marquez arrives in Motegi following his powerful win in Thailand, which extended his Championship lead to 77 points over nearest rival Andrea Dovizioso and 99 over Valentino Rossi. 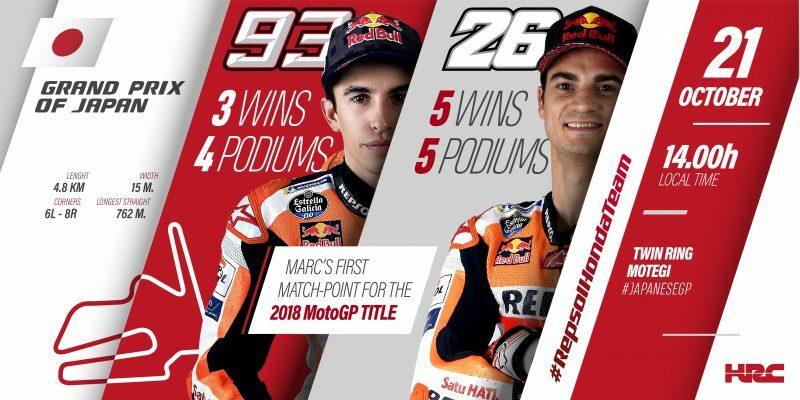 With a maximum of 100 points available across the season’s remaining four races, Marc could mathematically clinch the 2018 MotoGP World Title at Honda’s home Grand Prix (if he finishes ahead of Dovizioso or doesn’t lose more than two points to him, and if Rossi doesn’t win the race while Marc finishes out of the points). Marc has already won two of his four MotoGP World titles at Motegi, in 2014 and in 2016 (when he also took his first MotoGP win at the circuit). Dani Pedrosa has also enjoyed brilliant results at the Twin Ring Motegi, and with five victories across all classes, he is the most successful rider at the track. Furthermore, Marc and Dani are the only riders on the current MotoGP grid who have managed to post Motegi wins in all three classes. Honda, with eight victories, is the constructor with the most victories at Motegi, followed by Ducati with four and Yamaha with three. Marc Marquez has 3 wins—1×125 (2010), 1xMoto2 (2012), 1xMotoGP (2016)—plus 4 podiums and 2 pole positions. Dani Pedrosa has 5 wins—1×125 (2002), 1×250 (2004), 3xMotoGP (2011, 2012, 2015)—plus an additional 5 podiums and 4 pole positions.